"Glenn Tipton – I shook his hand and told him I stole everything I do from him"
A lot of people assumed that Saliva were out for the count when lead singer and founding member Josey Scott quit the best-selling, Memphis-based metal quartet in 2011. As it turns out, rumors of the band's demise were greatly exaggerated - the group sounded badder and bigger than ever with new vocalist Bobby Amaru leading the charge on last year's In It To Win It, and their upcoming set, Rise Up (due out April 29th) could stand as a musical career high. 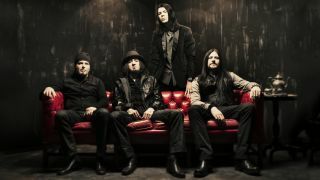 Ahead of the album's release, Saliva are breaking in some new songs live on a US tour. Between dates, guitarist Wayne Swinny sat down with MusicRadar for a little thing we call Famous Firsts. What was your first guitar, and how old were you when you got it? "My first guitar was a department store no-name model Strat copy from Fred P. Gattas on Knight Arnold in Memphis, Tennessee. My dad took me. I got a guitar, a 15-watt combo amp and Kiss' Dressed To Kill for around 50 bucks, which was a lot of groceries back then. [Laughs] That store and my dad are long gone, but I remember it like it was yesterday. That day changed my life forever." What was the first band - or album - that made you want to be a guitarist? "See answer to the first question. [Laughs] After that, I wanted to learn everything and anything with distorted guitars and screaming solos: Judas Priest, Sabbath, UFO, AC/DC, Zeppelin…. What was the first guitar solo you learned how to play? How long did it take you to play it "correctly"? "Rock And Roll All Night by Kiss. Ace's solos were the best tutorial ever on pentatonic blues-based rock solos. Next was AC/DC's Highway To Hell. Onward and upward to Glenn Tipton, Michael Schenker and Jimmy Page. Then Randy Rhodes happened and blew my mind to bits. Then Steve Vai - gimme a freakin break! "I must also mention that I grew up in Memphis, Tennessee, in the shadow of Shawn Lane, who is, in my opinion, the most-incredible guitarist/musician ever - hands-down no competition. You doubt me? Look up the myriad of bootleg low-res vids on YouTube. If you're a guitarist and you think you can play fast, Shawn Lane has something to show you. Ask Buckethead, who's the baddest guitarist ever - he will tell you the same thing. Oh and by the way, Shawn was also virtuoso level on the piano, drums and bass. My friend Bill Oliver took me to his house to meet him once. I couldn't even comprehend what he was playing. Nicest guy you could ever meet, too. Rest in peace, Shawn Lane - the greatest." What was your first really good guitar and amp? "An Ibanez Iceman and a modified Ampeg V-2 head. My friend Sam Dlugah was a mad scientist - a Bonifide genius, actually. He added a master volume so I could get the gain I wanted without a distortion pedal. Rich kids with their Marshall amps wished they had that tone. [Laughs] No disrespect to Marshall amps - I love em. My 100-watt '76 is my baby, but I got that way later after I was already touring. Sam's modification was like having nitro before everyone else." What was the first band you were in? What was it like? What was the first song you wrote that you thought was great? What was the first guitar you got that made you feel as though you had found "your sound"? "My first real Fender Strat, but it wasn't right until I chiseled out a hole. Yes I didn't have a drill or a router, so I chiseled out a hole big enough for a humbucker - the one from my Ibanez Iceman actually. Metal!" When was the first time you played to a big audience? What was that experience like? "The garage days answer is at the Strings & Things Battle of the Bands at the Overton Park Shell. I was mortified with stage fright, but as soon as we started playing, that went away and it got awesome really fast. The modern times answer is WrestleMania at the Toronto Skydome in front of 70,000 people. Saliva did the Dudley Boys theme track Get The Tables, so they had us play it live as the guys made their entrance. It was freakin' awesome, and it was over way too fast. Much thanks to Vince McMahon and the entire family and staff at WWE. Top-shelf professional all the way. I still have fans tell me that's how they discovered us." Who was the first guitar hero of yours that you got a chance to meet? "Glenn Tipton. I shook his hand and told him I stole everything I do from him, which is largely true. He looked shocked at first, and then he grinned and nodded in approval and was actually very gracious. We had a chance to meet the entire band a bit after that; I have that autographed pass in a framed at my home studio. Priest was a huge early influence for me, and that was a monumental thing to finally get to meet the original metal gods." What was the first thing you bought when you got your first big check from playing music?
" A '79 Firebird - the muscle car, not the guitar. [Laughs] No disrespect, of course, since I am a big fan of Johnny Winter, who ripped it up on his Firebird."